Имате въпрос към Rajarata Hotel? Удобно проектиран като за бизнесмени така и за почиващи туристи, Rajarata Hotel е идеално разположен в Град Анурадхапура - една от най-посещаваните части на града. Само на 0.5 km от градския център- това стратегическото местоположение на хотела гарантира на гостите си бърз и лесен начин за достигане до интересуващите ги точки на града. С удобното си местоположение хотелът предлага лесен достъп до всички градски забележителности, които задължително трябва да се видят. В Rajarata Hotel отличното обслужване и достъпните съоръжения допринасят за Вашия незабравим престой. Гостите на хотела могат да ползват съоръжения като 24-часов рум-сервиз, безплатен WiFi достъп във всички стаи, 24-часова охрана, камина, ежедневно почистване. Като допълнение всяка хотелска стая предлага широка гама от удобства. Много от стаите са с телевизор с плосък екран, стойка за дрехи, безплатно разтворимо кафе, безплатен чай, спално бельо, за да удовлетворят и най-изискания вкус. Хотелът предлага прекрасни развлекателни съоръжения, такива като стая за йога, открит басейн, детска площадка, басейн (за деца), градина, които ще направят престоя ви незабравим. Насладете се на несравнимото качество на услугите и престижното местоположение на Rajarata Hotel. Traveled with my Wife, Daughter, My Mother and my Brother. We booked 2 rooms for 2 days on BB basis. Requested a pool side room when check-in an the reception was kind enough to fulfill our request. Breakfast buffet is not international but It is a very good for a person who is looking for authentic Sri Lankan breakfast dishes. Restaurant/Rooms are clean and all the facilities we expected were there. Had a bad experience with Pool Usage but later management apologize for the mistake the pool boy done and explain he is new and getting used to the hotel culture. Cost is bit expensive as we have booked last minute. Located in a good area and the stay was very pleasant my family enjoyed the stay. Friendly staff, meals very good, specially sri lankan typical cousins. Calm and peaceful place in town. Rooms clean and average condition. Only negative thing I experienced room category allocation. Same standard room they provides as deluxe room just given fruit platter. I was in this hotel last June with some friends and most of them were from abroad. We had a very nice and relaxing holiday. Through that experience, I recommended this hotel for my wife and son who are staying there right now. Their feedback is excellent. The hotel is as published. i booked 2 rooms and asked for it to be close to each other and I got what i asked for. Its a small and nice boutique hotel on a quiet street. The rooms are a good size and beds are comfortable. As our rooms were on the ground floor, the breakfast place was very near. The hotel staff were also very polite. Nice place for a quick stay. It is a nice hotel with a good size pool. Rooms were fine. Clean and big. The breakfast was good with a large selection of western and local food. The staff were friendly and even let me check in early at no extra cost. But..... It seems that almost every day there is a wedding held there. This means guests can't use the pool or restuant. Instead guests have to eat in what is basically a corridor upstairs. Loud music goes on til midnight too. Think this place needs to decide if it is a hotel or wedding hall. Dear Guest, Thank You for your review. I will inform the management the comments what you have done for the improvement of the hotel. Once again thank you for your valued review and very much in like your arrival to stay with us and to have comments once again to us. The location and the meals of the hotel are really great. The staff is very helpful. The only drawback is that it was not possible to alter the temperature in the AC and it was extremely cold in the night that we had to ask for blankets. Other than that the hotel was extremely good. Will recommend it to anyone. Dear Dinusha, Thank you for your review and the comments what you have done is very valued for us to rectify our shortcomings and to give an better service to our valued guest. Отседнахме 4 вечер/и в май 2018 г. Value for money hotel, clean and comfortable bedrooms with air conditioning, a safe, a TV and a good power shower, rooms are large. The staff are lovely, always happy to help you. The only negative thing is there are no mattresses on the sun loungers near the pool. The pool itself is maintained well. I stayed in delux rooms with my family and 4 year old kid. This is my second visit to this hotel in 2 years time. Hotel staff is really nice and smiling always. Provided a good service. Last time there was mosquitoes in the room where i stayed. But this time all good and room is clean and nice. Eventhough the meals are ok there wasnt much taste on it and not much of a variety. This is the area where they can improve. i have noticed the same on my last visit as well. but food is ok. I can recommend this place to anyone. I initially booked this for 2 nights only stayed the night there. Room was ok bathroom sink water wasn’t draining properly, tv was stopped asked reception said settalite problems, can’t go anywhere in the hotel flys everywhere so end up in the room with no tv. For vegetarian not many options for us , also veg & nonveg kept together not separate puts us off having anything. Reception service very poor I went to checkout in the morning she said ok I will check didn’t even finish with me , then another white couple checking it she comes out and say hello sir how can I help you? She did all their checking out process first let me wait for mine , then said ok nothing for you. I traveled srilanka four places on my tour this is the worst hotel I would recommend someone to stay. very good place. friendly staff. value for money. nice place to be with your family. 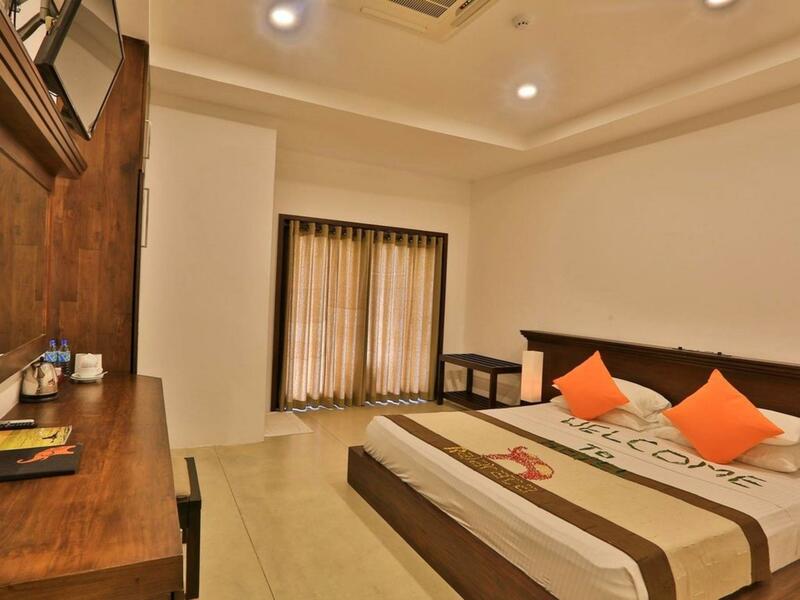 The hotel is situated southeast of the town in a quiet location within easy strolling distance of a lake and jogging track. It is easy to cycle to the major sites, the hotel will organise bikes (500 rupees per day) or arrange a tuktuk. The hotel itself is spotlessly clean. Rooms are spacious and I think all have a balcony or access to the pool. The pool is large, well maintained and has sun beds and shade. It is set in a grassy garden where hornbills nest in the tree. The main source of guests is coach tours. So the hotel is quiet during the day. Meals are mostly buffets. The food is well cooked and has a range of dishes which appeal to international taste. However, you may order Sri Lankan dishes although this is not advertised. The staff are extraordinarily helpful. They will arrange transport at very reasonable prices. I have already suggested to the management that the hotel looks a bit plain and utilitarian. It could do with some pot plants and wall hangings! I enjoyed my stay here. 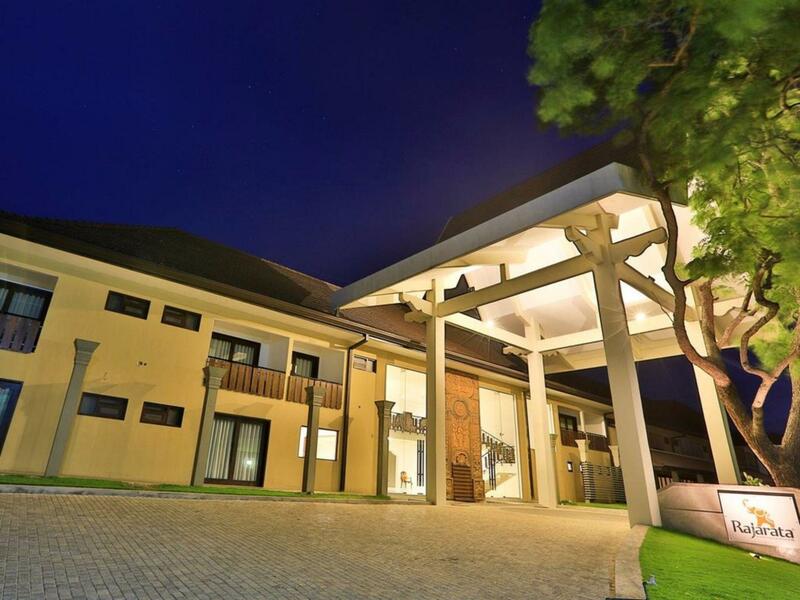 Great location in Anuradapura. All places of interest are around 10 minutes away. Small walk to the lovely tank close to the hotel. Staff were very nice. The Sri Lankan food served was very tasty. Rooms were clean and everything worked. Good value for money for this area. 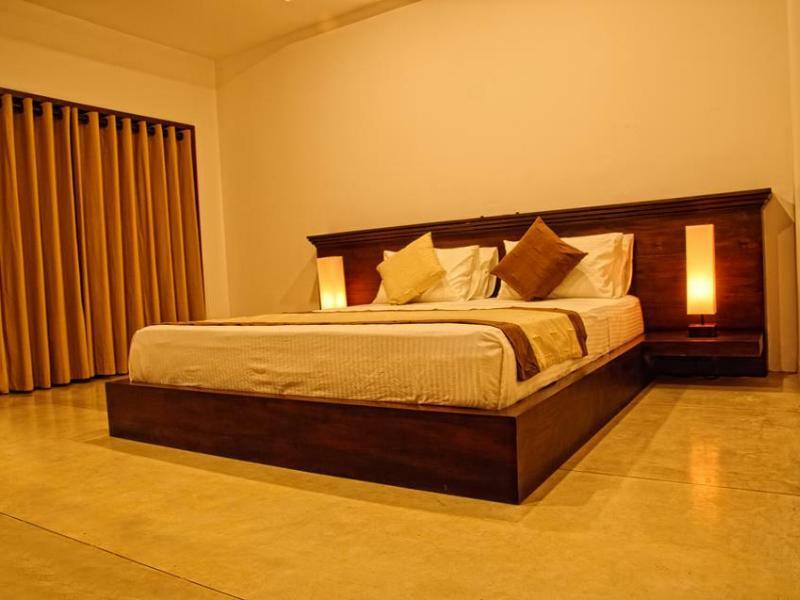 There are not many high rated hotels in Anuradhapura. Even those who are on the high end are basic and sometimes not well maintained. This hotel was renovated and is therefore comparatively clean and decent. That is if you overlook all the corners! Staff needs improvement. Food can be improved! Also on my morning departure they missed the morning call. And the ladies at the reception -- they need a lesson on how to smile!